One of the most startling rooms in our Magritte exhibition contains just two paintings – the infamous and near identical versions of The Flavour of Tears of 1948. The last time these works were seen together in the same gallery was in 1998. Magritte has been described as a ‘creator of images’ and his apparent disclaiming of the aura of the unique work of art was emphasised when he pithily proclaimed: ‘I don’t create paintings, I create reproductions in oil.’ The two The Flavour of Tears works on display at Tate Liverpool each show a bird morphing into a leaf, which is in the process of being eaten by a caterpillar. Imbued with a sense of brooding melancholy, the image has been interpreted as being an expression of sorrow for the Second World War, which Magritte spent in occupied Belgium. Magritte, of course, painted numerous variations of certain subjects, usually in response to the demands of the art market. Perhaps the most explicit example of this are the twenty-seven versions of The Dominion of Light created between the late 1940s and the early 1960s. Whilst these variant images usually differed in some way, the artist evolving and rescaling the original image, the closeness of the two The Flavour of Tears works presents a rare and mysterious case. The legendary art historian David Sylvester reported that the similarity of the two works is such that even the inscriptions on the back of each correspond exactly. Sadly, during the installation of our exhibition, we were unable to verify this owing to the protective backing boards on the reverse side of both canvases. 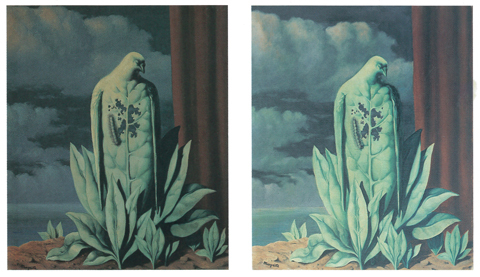 So why did Magritte create two near identical versions of the same image? Research shows that he created the works at a time of financial hardship and it is believed that interest in The Flavour of Tears by two collectors, who were unknown to one another, led to Magritte creating a double – an exact copy, rigorously faithful to the ‘original’.